Following Glee star Cory Monteith's sudden death on Saturday, we bring you some of our favourite Cory moments. Cory Monteith, best known for his role as sports jock-turned-Glee star Finn Hudson on the hit Fox TV series Glee, was found dead in a hotel room in Vancouver, Canada, on Saturday. Following his sudden death at only 31 years old, we thought we’d bring you some of our favourite Cory moments. 1. The fresh-faced “gleeks” captivated audiences worldwide in the series’ pilot episode with their rendition of Don’t Stop Believin’, and Finn (Cory) and Rachel (Lea Michele) showed us why we love the hit couple and the many duets and on-screen moments that followed . . .
2. They’re a firm favourite Glee couple, so when Finn proposed to Rachel we were all super happy! 3. One of the best moments in which Cory showcases his talents as he starts off this Glee group cover of Coldplay’s The Scientist. 4. While Rachel does all the singing to Without You in this key Glee moment, it captures how we all feel about the loss of Cory Monteith, who shone so brightly on all our TV screens. 5. Their on-screen chemistry is absolutely magnetic and they’ve produced some of the finest duets we’ve seen on the hit show. It probably came easily for the pair who were also an off-screen couple and who were last pictured together in Los Angeles on 8 June. Their We’ve Got Tonight duet is one of our favourites! 6. After a few squabbles with his future stepbrother, Finn dedicates a song to him at their parents’ wedding. He even insists on a dance! Just the Way You Are is exactly the way we loved Cory . . .
7. When he says “I love you” to Rachel right before they sing Faithfully at sectionals (the first round of the annual show choir competition)! 8. One of the many times Finn had us in tears for his sincere singing and his ability to stay true to his commitments was when he sang I’ll Stand by You . . .
10. 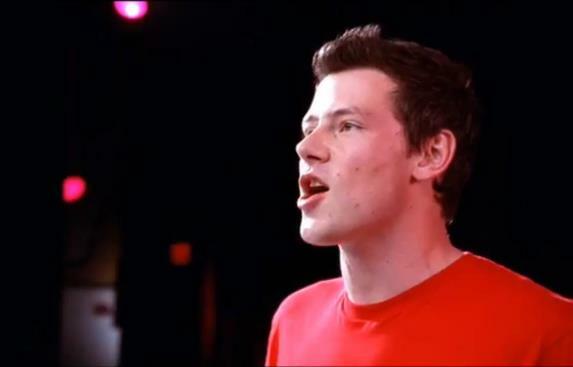 Here’s Cory’s first audition for Glee. The odd audition won him the role of popular Finn Hudson.